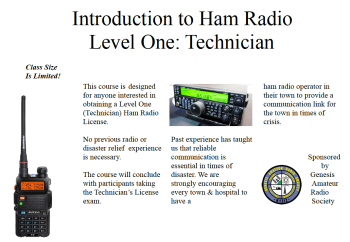 The Genesis Amateur Radio Society is pleased to present an “Introduction to Ham Radio” Technician Course, on May 10 and May 17 from 9 AM-3 PM at the Middleborough Public Library. The course will utilize the ARRL’s Tech Q&A 5th Edition, and will culminate in an FCC exam conducted by a volunteer examination team. The deadline for registration is April 26. Email n1ir@arrl.net or sign up online at https://docs.google.com/forms/d/1TJ4_i–2wsb9Oh1hVBU_mpeEWcpJRLE9BI5fYWBQgMA/edit?usp=sharing.